The other day I needed to come up with a dessert for my kiddos. Now, without sounding boastful, I ought to tell you, I am well known for my banana bread and my coffee cake. And on this day I had a bunch of ripe bananas, as well as a can of caramel apple pie filling. I decided to try an alternative to my banana bread recipe, making a scrumptious cake instead. My kids love it! 1: Preheat oven to 350°. 2: Coat your bundt pan in shortening and flour; set aside. 3: In a medium bowl combine flour, baking soda, and salt; set aside. 4: In a large bowl, whisk together egg and sugar until well blended. Fold in bananas, pie filling, and sour cream gently. Juice lemon into bowl. 5: Add the flour mixture to the banana cake bowl a little at a time, stirring with each addition until everything is thoroughly combined. 6: Poor the cake mix into the bundt pan; bake 50-60 minutes until toothpick inserted comes out clean. 7: Let the cake stand for up to five minutes, then remove it from the pan, transfering to a cooling rack. Cool cake completely. 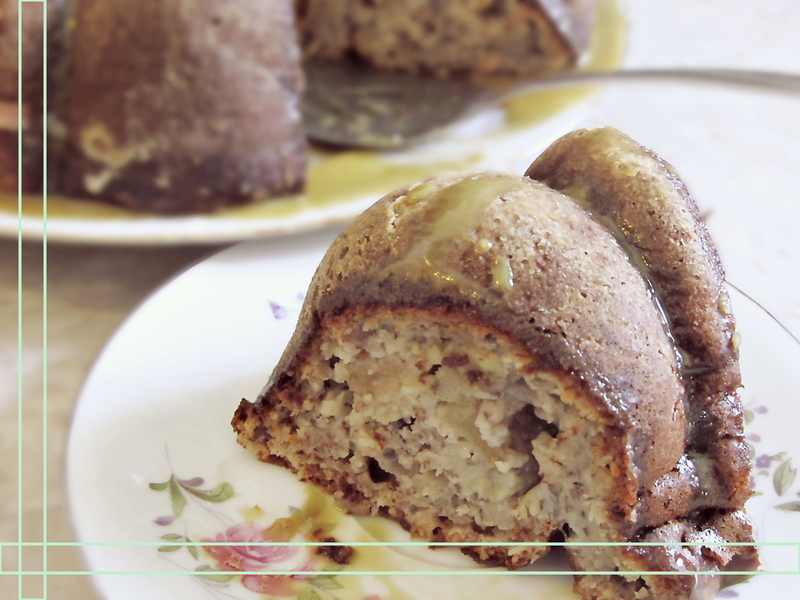 8: In a small bowl, mix together all ingredients for the icing and drizzle lightly over cake. Freeze bananas a day or two before using, then pull them out the morning of baking. They will be the ripest and most delicious. When juicing lemons, use your hand as a sieve Cut the lemon in half and hold it right-side-up in your palm. This will allow your hand to catch any seeds that may squeeze out. You also get the most juice with this grip.